The one thing that President Obama and the National Rifle Association seem to agree on is that the U.S. needs to develop a more effective firearms policy. Over the past month, both sides have offered suggestions: Obama has proposed a four-part plan to ban assault weapons, protect schools, implement background checks, and screen out mentally ill potential gun purchasers. As for the NRA, spokesman Wayne LaPierre proposed the "National Model School Shield Program," a plan to train teachers in the use of firearms and enlist volunteers to patrol school grounds. Both proposals have severe shortcomings: Obama's assumes the passage of extensive gun-control legislation -- wishful thinking, given Congress' severe disfunction and the lobbying power of the NRA. As for the NRA, its notion of elementary schools being patrolled by armed volunteers and militarized math teachers is harrowing at best. To develop a third, better alternative, one might consider looking back to the specific wording of the Second Amendment. 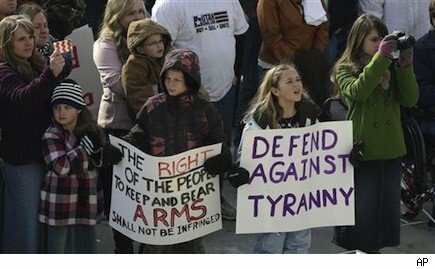 The trouble is, the Second Amendment is notoriously confusing. Stating: "A well regulated militia being necessary to the security of a free state, the right of the people to keep and bear arms shall not be infringed," the amendment guarantees the right to keep and bear arms, but does so with a caveat, qualifying the right by couching it in terms of a military organization. Today, activists on both sides of the gun divide argue about what the Founding Fathers meant by "well-regulated militias." Gun opponents claim that the Second Amendment's wording referenced a power struggle between state militias and a federal army -- the resolution of which renders much of the amendment moot. Meanwhile, gun proponents argue that "well-regulated" essentially meant "well-armed," suggesting that there should be few limits on gun ownership. The battle between these perspectives will never be decisively resolved, but the militia caveat may offer a way to bridge the firearm divide: Put simply, a well-regulated, centrally-controlled corps of citizen militias could be the solution to the question of how America can guarantee -- and regulate -- the right to bear arms. In America's early days, citizen militias were key to its military strategy. Composed of civilians attempting to defend their communities, these militias trained together, and -- during the Revolutionary War -- fought the British together. In so doing, they established a standard for community involvement and engagement that remains a proud part of America's history. Today, gun rhetoric often flies in the face of this sense of community and national identity. The NRA, for example, aggressively positions gun ownership as a means of protecting oneself against other members of the community. Some gun advocates go even further, suggesting that ownership is necessary for protection against the federal government. A modernized version of citizen militias could tamp down this rhetoric -- and help to rebuild community spirit in America. Open membership would ensure that diverse portions of the community would be put in a position to work together. Militias, in turn, would ensure that their members were trained, effective, and invested in the community. Members would have to undergo extensive firearm training, and would have to prove their mastery of each firearm they own. Within the militias, members would answer to militia leaders, who would have the power to oversee their gun ownership and usage. These leaders would be responsible for insuring that all members were well-trained, well-drilled, and mentally stable. If a member demonstrated irresponsible behavior, his or her militia leaders would be able to withdraw that individual's right to bear arms. Militia leadership would be a full-time, paid position, and leaders would report to regional heads, who would report to state leaders, and so on, up a chain of command to the federal government. Ultimately, all militias would be administered through an executive federal department, such as the Department of the Interior, the Department of Defense, or the Department of Homeland Security. The whole program could be paid for by a small tax on firearm and ammunition sales. Such citizen militias could prove a useful addition to our communities, too. Certainly, when it comes to searching for lost children, dealing with natural disasters, and performing other community service functions, a strong, dedicated, community-based group could be hugely valuable. While this system hasn't been tried in the U.S., versions of it exist in other countries. Israel, which the NRA's LaPierre has cited as an ideal example of a well-armed society, has an extremely centralized gun structure that is directly controlled by the government. Private gun owners have to undergo extensive training and testing, and must get recertified every three years. Israel rejects 80% of applicants for private gun licenses and largely restricts private gun ownership to people who live in dangerous areas, like the West Bank or near the Lebanese border. Switzerland is an even better example: The Swiss government subsidizes ammunition sales, sponsors marksmanship competitions and actively encourages firearm usage. Most young men are called up for compulsory military service, and the country sponsors public firearm training. After leaving the military, Swiss men remain part of the militia until age 30, and keep their military-issued rifles in their homes. After age 30, gun owners have to apply for a permit from the government, which closely monitors firearms conduct. The community and government-based gun control systems in Switzerland and Israel have been fairly successful in limiting gun violence. In 2010, the U.S. had 3.6 firearm homicides per 100,000 people. That same year, Switzerland had 0.52 firearm homicides per 100,000. In 2008, the last year for which figures are available, Israel had 0.83. More to the point, Switzerland's gun system actively encourages community support and engagement. Gun owners are respected and vital members of society, tasked with protecting their homes and their neighbors from external enemies. So Switzerland's system encourages its gun owners to support their country, rather than destabilize it. This, in particular, is one area where America could take a lesson. In America, neither the left nor the right has a strong answer to the problem of gun violence. In the absence of gun control regulation, widespread firearm ownership will be dangerous at best. On the flip side, centralized firearms control would be hard to enact, expensive to enforce, and would alienate many gun owners. The solution I've proposed, while not ideal, would be less expensive, more popular, and would supply an element that has been sadly missing from both sides of the debate: personal responsibility.